Here's a big surprise for everyone. My favorite color is purple. I know it's a shock and I can understand if you need to take a break and come back later to finish reading this post. However, since purple is my favorite color, I am drawn to purple plants. My favorite flowers are all purple, I adore plants that have purple leaves, and Beautyberry is super special to me because of the bright purple berries. I mean, just look at it, it's such a pretty plant! Luckily a variety of this awesome plant with such showy berries grows here in Central Florida, and has more uses than just good looks. Callicarpa americana is our variety, but there are over 140 different species world wide. Unfortunately, this plant is not commonly used in the West. Many Native American tribes used Beautyberry for several reasons, mostly medicinal in nature, however it's fallen out of use in the modern era. Many foragers have listed this plant as poisonous, however I have eaten it as a trail-side snack for years without any problems. It's possible that this stigma comes from one of the Native American uses for the leaves. Certain tribes would use the leave as a fish poison, stunning the fish so that they could be more easily caught. I don't consume the leaves, I just eat the berries even though the raw berry is fairly flavorless and kinda mealy. However, Beautyberry is known to make a great jelly. One of my favorite foragers, Green Deane, made a video that shows the plant and jelly. Check it out here. Authentic Florida also has a great and easy recipe for Beautyberry Jelly here. Parts Used- The whole plant. Traditional Chinese Medicine- Known as Zi Zhu in TCM, Beautyberry has quite a few traditional uses. Astringent and cooling, this herb is useful to help treat bleeding in the lungs and stomach. It also helps to clear toxins, particularly in the case of skin problems. Beautyberry is also a common treatment for rheumatism. Antibacterial- The bark of various species of Beautyberry has been tested, in numerous studies, for antibacterial activity. Many of these tests show that Beautyberry bark is antibacterial in nature, and even targets certain strains of bacteria such as Methicillin-resistent Staphylococcus aureus (MRSA), Bacillus cereus, Salmonella typhimurium, and many strains of cyanobacteria (blue-green algae). Antiviral Activity and Malaria- Native American practices used Beautyberry in sweat lodges to help reduce fevers and treat malaria. 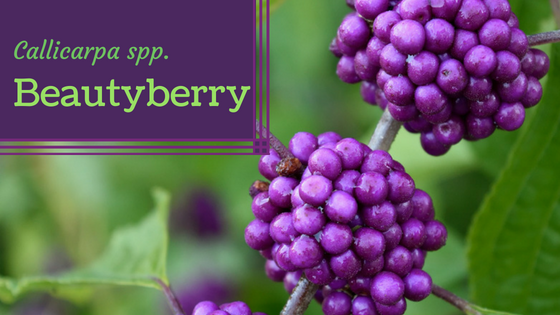 Modern practices also use Beautyberry to treat herpes simplex. A handful of studies have been done to confirm that Beautyberry extracts may actually prevent the replication of herpes simplex and polio viruses. Antifungal- In Mexico, extracts from Beautyberry leaf are used to treat certain fungi harmful to plants. However it has also shown promise in helping treat certain yeast infections caused by Candida albicans. Antioxidant Activity- Though the berries don't have much of a flavor raw, quite a few nutrients are present. Among the nutrients found in Beautyberry berries, there are a number of antioxidants. Several studies have also shown proof that Beautyberry extract has both direct and indirect antioxidant activities, which helps reduce inflammation and prevent oxidative stress. Insect Repellant- My favorite use for Beautyberry leaf is as an insect repellant. Just crush the leaf and rub it on your body, clothes, and hair. Some people even wear the leaves in a hat band, or tucked into any number of crevices in their clothing. You can also use Beautyberry essential oil. This seems to work best on mosquitoes and fire ants. In the case of ticks, most ticks do stay away, but not all ticks do. It's advisable to still perform tick checks after spending long stretches of time outside. This herb is so good at this particular job that many tests have shown it being more active than DEET at repelling insects. Contraindications and Warnings- Some people believe this plant is poisonous, however that belief may come from a Native American use for the leaves, as a fish poison. I have personally snacked on the berries for years and never had any adverse effects. However, allergic reactions might occur in some individuals. I only included a basic introduction to this amazing herb. 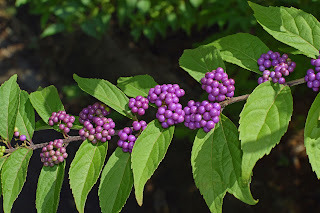 I hope you have learned a new appreciation for one of my favorite plants, Beautyberry. If you have any questions or comments, please leave them below.